In 2013, the U.S. Army will implement the Integrated Warfighter System (IWS), evolving what we know as the modern soldier. IWS combines advanced weapon systems, satellite communication devices and enhanced survivability into one fully integrated combat system. The IWS program has been developed to meet these new threats head on. Now, it can be tested on the battlefield. Following an insurgence in the heart of Mexico City , the U.S. Army's most elite Special Forces team is deployed to the center of the conflict to regain control of the city. Greatly outnumbered but fully equipped with the IWS, this elite team is the first and last line of defense on the battlefield. They are the "Quiet" professionals. They are the Ghosts. Gain access to the future of military technology. 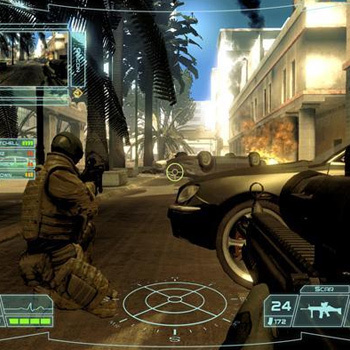 Using a fully integrated combat system with cutting-edge weapons and revolutionary communication systems, gamers embody the soldier of the future. Based on actual U.S. Army research, the Ghosts give gamers a realistic view of how war will be fought in the next decade. Use the revolutionary Cross-Com, a communication device powered by satellite technology. Attached to the soldier's monocle, the Cross-Com provides full situational awareness and command of the battlefield. Command the Ghost squad and remote allied forces and drones, and direct artillery and air strikes. See what the squad sees and receive visual and auditory intel from allied forces and unmanned drones.